If you were a lad who came of age in the ‘80s, chances are that Leia’s gold bikini from The Return of the Jedi may have almost single-handedly kickstarted your foray into puberty. It’s an interesting dichotomy: Leia was, for the most part, a strong, well-written female role…but they still found a convenient excuse to get her wearing as little as possible for that iconic sequence. If you’ve ever wondered about how the actress behind it all felt about that duality, you’ll find much to intrigue in a vintage Rolling Stone interview with actress Carrie Fisher that has popped up online. She has no friends, no family; her planet was blown up in seconds — along with her hairdresser — so all she has is a cause. From the first film, she was just a soldier, front line and center. The only way they knew to make the character strong was to make her angry. In Return of the Jedi, she gets to be more feminine, more supportive, more affectionate. But let’s not forget that these movies are basically boys’ fantasies. So the other way they made her more female in this one was to have her take off her clothes. This year marks the 30th anniversary of Return of the Jedi. Lucasfilm has released a lot of goodies to commemorate the anniversary, including a Making of the Return of the Jedi book by J.W. Rinzler, and a rare teaser trailer that features the sequel film’s original title Revenge of the Jedi. Recently rare footage and alternative takes from Return of the Jedi surfaced. The missing footage was thought-to-be-lost until someone unearthed a rare laserdisc. The finder posted a few clips from the missing footage on Facebook, but now they’ve released the entire 30 minutes of raw, unedited b-roll from the third film in the Star Wars trilogy. The missing footage begins with R2-D2 repairing Luke’s X-Wing on Dagobah, but mainly features Luke Skywalker’s reunion with Master Yoda on the swamp planet just before the 900-year-old Jedi Master dies. 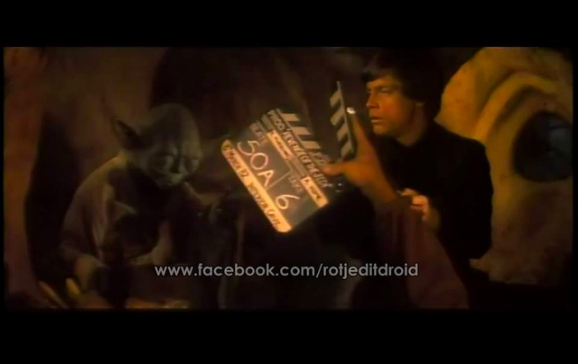 It’s pretty amazing to watch Frank Oz and Mark Hamill, just moments before takes of the iconic scene. Oz asks for lead-in lines, while Hamill reacts to the Oz-operated Muppet. This year marks the 30th anniversary of the third and final chapter in the Star Wars original trilogy. To celebrate Return of the Jedi (AKA Star Wars: Episode VI), Lucasfilm has released a “Making of Return of the Jedi“ book and the original teaser trailer for the film, from back when they were still calling it Revenge of the Jedi. Now rare, behind-the-scene footage of the film’s production from a once-thought-lost laserdisc (remember those?) has been posted on Facebook. It’s a rather well known fact that before it was released into theaters in 1983, Return of the Jedi, the third installment in George Lucas’ beloved Star Wars space opera, the movie bore the title Revenge of the Jedi. Just how close did the world come to following up the bummer ending of Empire Strikes Back with a little vengeance, you might ask? Pretty damn close, close enough, in fact, that there were trailers, like this one, with that moniker released into movie theaters to hype up the film. Would the world really have been changed that drastically if Lucas had stuck with Revenge over Return? It’s easy enough to envision sitting around, drinking with your Star Wars obsessed little buddies, discussing particular merits or flaws of Revenge instead of Return, or the tonal contrasts between Revenge and Empire. And as you can clearly see from this trailer, the film still has everything that makes Jedi Jedi. There are Ewoks, a speeder bike chase, Han Solo and Luke Skywalker being all heroic, and Princess Leia in a metal bikini. The final film in the original Star Wars trilogy was three years in the making after the release of The Empire Strikes Back in 1980. Now, however, Return of the Jedi has gained fresh importance as a stepping-stone to Star Wars: Episode VII. The third and final Star Wars book from author J.W. 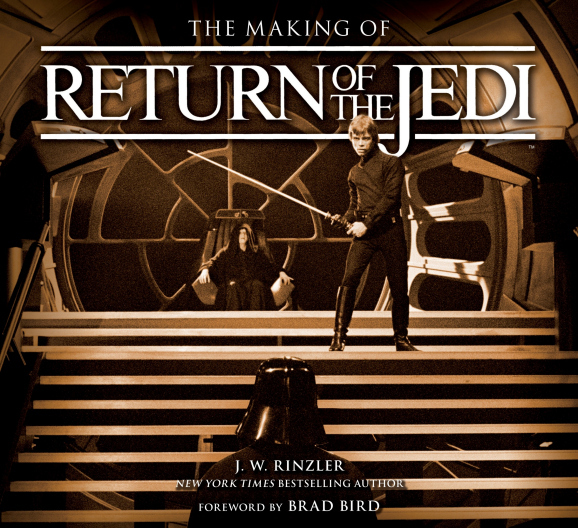 Rinzler takes an in-depth look at the making of Return of the Jedi. The Making of Return of the Jedi includes never-before-seen production photos, rare interviews and stories from its cast and crew, concept art, and script excerpts. J.W. Rinzler had unprecedented access to George Lucas and the Lucas Archive for the in-depth book series, which also celebrates the 30th anniversary of the release of Return of the Jedi in 1983. It’s actually pretty amazing to see what Rinzler compiled for the behind-the-scenes book, which dives into the entire process of making the final movie in the original Star Wars trilogy, from Leigh Brackett and Lawrence Kasdan’s screenplay to the film’s world premiere.